Nu-Heat invited twelve Registered Installers to attend a conference in Corby where they met members of the Nu-Heat sales team to gain an insight into both Nu-Heat and industry news. Topics presented by Field Sales Manager, Paul Wood, included Nu-Heat’s Installer Network, new product developments and updates on Government grant schemes, such as the RHI. “Our Registered Installers were excited to hear about new initiatives and products that we will be launching over the next twelve months,” says Paul. Delegates were given advice on generating their own business and undertook a workshop on marketing and sales techniques. 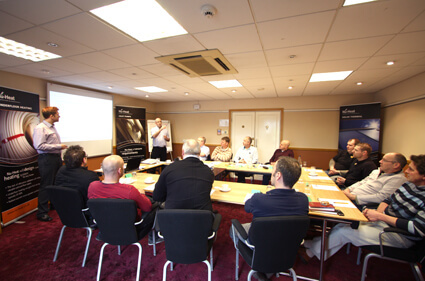 The continued need for training and development in the renewables sector was a subject that many installers were keen to discuss. The focus for Nu-Heat going forward is to use the comments and opinions of the installers to strengthen the partnership further. A number of further conferences are being planned for 2012.